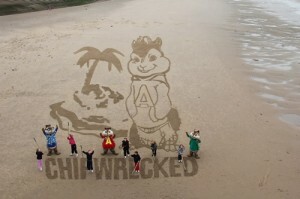 I came back from Germany on Wednesday to take part in a Sand drawing for the new Chipmunks 3 DVD called Chipwrecked on the Friday. I say take part as Andy Moss who goes by many names, ‘The Mexican’ to ‘Moscachino’ was the sole director of this event for Sandinyoureye. Anyone who has project managed events will know that there is much more to it than just turning up on the day and drawing in the sand or making a sculpture. You have to think of every eventuality before it arises, plan and prepare accordingly, liaise with the client and location managers, design the actual art piece, and then deal with the things that you haven’t thought of on the day. This is no easy task. But Mr Moss did us proud and I would like to take this opportunity to congratulate him for a job very well done! 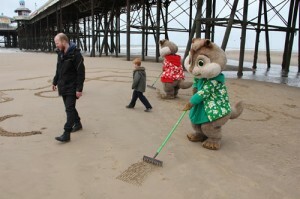 There is a picture of a 45 meter tall chipmunk called Alvin below Blackpool tower to prove it!